Our new heavy duty floor protector that will help you to replace the old Rosin Paper. The Poly Craft Mask has a new system called three-ply, made of a flat fiber-glass between a craft 40 pound paper at the bottom and a polyethylene sheet at the top. This system is better because the layer of polyethylene will not allow the paint to bleed or spoil your floor surface and the bottom layer will create a soft coat that won''t damage the surface you are protecting. The Poly-Craft Mask will last much longer then the Rosin Paper, is a water proof system and is very easy to install. You can use the Re-enforced Floor Protection- Poly Craft Mask in order to protect your marble, tile, vinyl and any other hard surface. 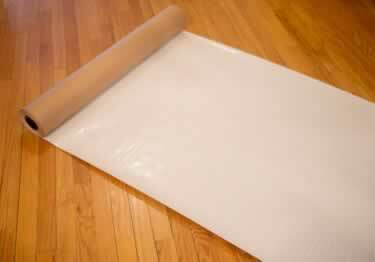 A heavy duty floor protector that will help you to replace the old Rosin Paper. The Poly Craft Mask has a new system called three-ply, made of a flat fiber-glass between a craft 40 pound paper at the bottom and a polyethylene sheet at the top. This system is better because the layer of polyethylene will not allow the paint to bleed or spoil your floor surface and the bottom layer will create a soft coat that won''t damage the surface you are protecting. Best product - worked great for the formal party! I threw a "Prom" themed party at my house and had about 55 guests in dress shoes and heels walking around on my hardwood floors for 3-5 hours. People drank wine, ate horsdouvres, etc. I searched eerywhere for a flooring cover that would not rip, be easy to roll out, and not he slippery. Also I wanted a muted color with NO logos. This flooring worked out perfectly!! We used clear tape and the whole place looked great with that white flooring. You had the best price too. Thanks!! Offering glow-in-the-dark, high visibility, "caution", and "watch your step" anti-slip abrasive tapes in a variety of sizes. Quality aisle marking tape that will adhere to most any clean, dry, surface.